Please be advised that a person who knowingly makes any written false or fictitious statement or files a false or fictitious report to law enforcement authorities is subject to criminal prosecution. Once received your complaint will be reviewed for criminality. If the matter is determined to be civil in nature the District Attorney's Office cannot act as your private attorney. Website Please include "http://" before the website address. If this complaint involves a police department/officer, be advised only matters that are criminal in nature will be investigated. Conduct such as violation of department rules, being rude or disrespectful is an internal matter and should be reported to the Chief of Police or an elected official from that municipality. Also, if you chose, you may be able to pursue a civil action. If your complaint is criminal in nature and involves a police department/officer have you contacted the Chief of Police or an elected official from that municipality with your complaint? Please explain your complaint. Try to be brief, but be sure to tell WHAT happened, WHEN it happened, and WHERE it happened. Include witness statements, names, contact numbers. Attach copies of all supporting documents such as contracts, letters, receipts, cancelled checks (front and back), photographs, videos or any other papers that relate to your complaint. Once received your complaint will be reviewed for criminality. If the matter is determined to be civil in nature the District Attorney's Office cannot act as your private attorney. Please Read Carefully 1. I certify that the information provited in my complaint, including my identity and any factual statements or allegations are true and correct to the best of my knowledge, information and belief. 2. I certify that I have authorized the Allegheny County District Attorney's Office to contact the party(ies) against which I have files a complaint; and, that I further authorize the party(ies) against which I have files a complaint to communicate with and provide information related to my complaint to the District Attorney's Office. 3. 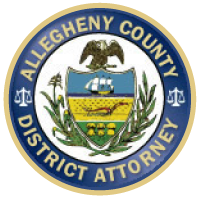 I certify that I have authorized the Allegheny County District Attorney's Office to transfer my complaint, and any or all of my attachments related to it, to another federal, state, local or other agency which may have jurisdiction over this matter. 4. I understand that a person who knowingly makes any written false or fictitious statement or files a false or fictitious report to law enforcement authorities is subject to criminal prosecution. 5. By submitting this form I am agreeing to all of the above points. Electronic Signature * Please type your full name. Please enter any two digits. By clicking "Submit" you agree to all of the above terms.